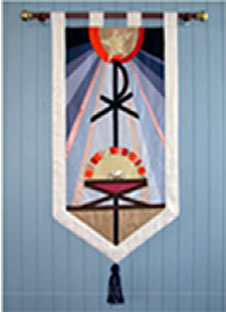 In 1999 a liturgical arts committee of six artists and a fabricator decided to make banners to visually enhance worship, and to remind worshipers of the seasons of the church calendar. In the course of this project the artists set aside their own interests and egos to work together to create God-directed banners. 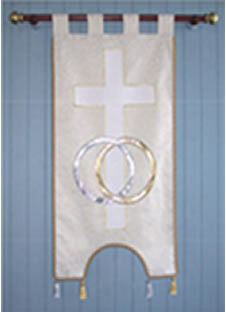 Since that time, nine banners have been designed, seven to cover the seasons of the church liturgical calendar, and two recently completed banners for weddings and baptisms. The banners help to make worship unique in this historic church. To create a tapestry-like appearance, upholstery-grade fabrics were used. Based on Scripture, each banner illustrates a Biblical theme or a parable of Jesus entirely in images. Designed by different artists, each banner takes on a different look. But the common use of fabric keeps them connected. 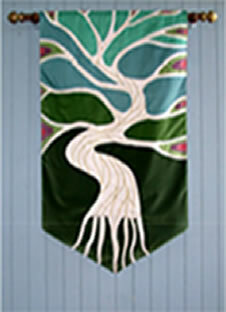 Each banner hangs in the sanctuary during the season for which it was designed. 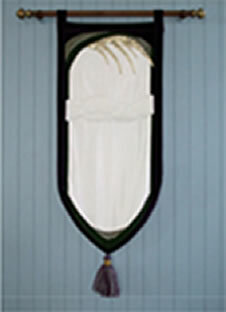 The Advent banner portrays traditional symbols of Christ; Advent is a time of waiting for Christ’s coming. 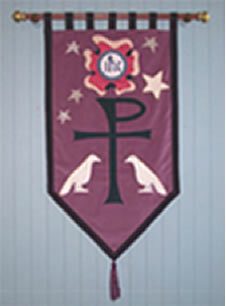 The Christmas banner follows the Advent banner, and celebrates the birth of Jesus; the Greek Chi Rho (XP) is taken from the first two letters of the Greek word for Christ, and the star and crèche tell the traditional story of Jesus’ birth. The Lent banner reflects themes in the Old Testament of God’s presence in the cloud, but a hint of the promise shows through the palm fronds. 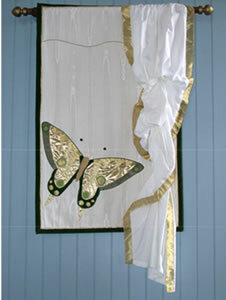 The Easter banner’s butterfly symbolizes the resurrection of Christ and the loose white fabric represents the shroud left lying in the tomb. 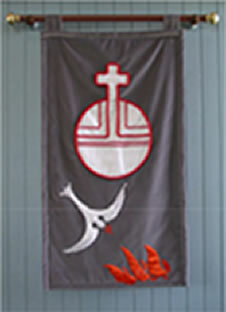 The Pentecost banner shows the gift of the Holy Spirit to the Disciples and Christ’s dominion over the world. The two Ordinary Time banners hang in the sanctuary from Christmas to Lent and from Pentecost to Advent. The first Ordinary Time banner is inspired by the verse in John’s Gospel that says, “I am the true vine and my Father is the gardener” (John 15:1). 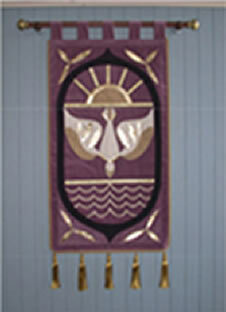 The banner speaks of God’s presence, love, and truth. The small colorful blossoms suggest our growth when we allow God to control our lives. 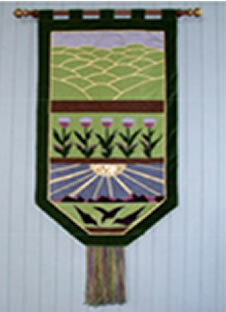 The second Ordinary Time banner illustrates Jesus’ story about the farmer who scattered seed in a field (Mark 4:2-8). It makes clear Christ’s message about the spreading of God’s kingdom.